2017 Sylvan Adams Nefesh B’Nefesh Bonei Zion Prize. by contributing in a significant way to the State of Israel. Click the image to read the recipient’s bio. 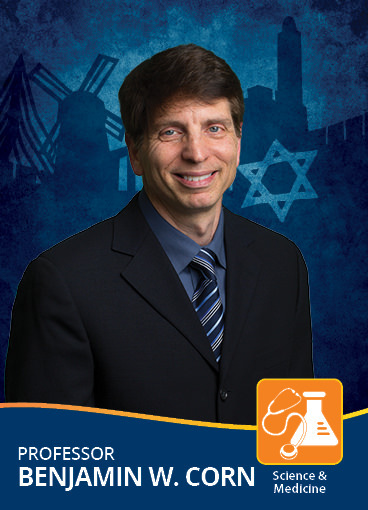 SCIENCE & MEDICINE: PROFESSOR BENJAMIN W. CORN has been the head of the Institute of Radiotherapy at Tel Aviv Medical Center (Ichilov Hospital) for 14 years and has 30 years of experience in utilizing radiation therapy to treat tumors. He has been an integral contributor to the revolution in therapeutic sophistication that has stimulated the directors general of the major hospitals in Israel to take notice and erect high-end linear accelerators in their institutions. He convinced the leadership of the National Cancer Institute in the U.S. to globalize their collaborative radiation-related research. Israel thus became the first international member of the Radiation Therapy Oncology Group (the arm of the NCI responsible for cutting-edge radiation research) and Corn chairs the international committee of the RTOG that has now expanded to include over 50 member countries including Japan, Ireland, Peru, Australia and Saudi Arabia. In addition, he is the Chairman of Life’s Door, an organization co-founded with his wife Dvora, which has led the movement of integrating spirituality into healthcare as a platform to offer hope and meaning for people facing serious disease and life’s end. Over 10,000 people in the State of Israel have been directly helped by the programs of this N.G.O. Through lectures and writing, Ben has been an “ambassador” who proudly showcases “blue and white” innovation in healthcare to the medical and bio-pharmaceutical communities worldwide. COMMUNITY & NON-PROFIT: BETH STEINBERG – Together with Miriam Avraham, a veteran Olah from the USA, Beth Steinberg founded Shutaf Inclusion Programs in Jerusalem, an innovative, informal-education program for children, teen and young people, with and without disabilities. Close to 300 participants, ages 6-23, enjoy inclusive, year-round activities: Day camps during Hannukah, Pesach and August vacations; Young Leadership Program for teens and young adults; Interactive Inclusion-Accelerator Workshops; Parent and family gatherings. Shutaf is a place of complete acceptance and inclusion for participants of all abilities, and from all religious and cultural backgrounds. Beth has also been part of Jerusalem’s active English-language cultural scene, co-founding Theater in the Rough (TiTR), with her eldest son, Natan Skop, and Toby Trachtman, in 2010. TiTR is dedicated to bringing quality, affordable and engaging theatrical experiences to Jerusalem audiences including summer Shakespeare in a Jerusalem park. The initiative represents the best of the age-old tradition of local theater coupled with training and developing talented actors with a community mindset. TiTR’s summer Shakespeare offerings have attracted thousands of English-language-theater enthusiasts from all over Israel to Bloomfield Gardens, where longtime and budding fans of the Bard enjoy classical theater presented free and out of doors, accessible to all. It’s arts for the people, by the people. 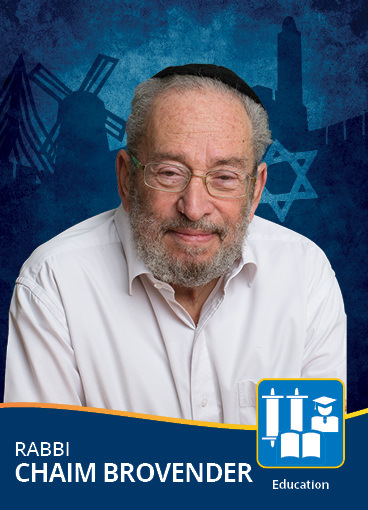 EDUCATION: RABBI CHAIM BROVENDER stands at the forefront of Torah learning programs for thousands who have come to Israel to explore their Judaism, and has created opportunities for people around the world to enhance their Jewish identity and connection to Israel. Starting in 1967, Rabbi Brovender began teaching American students who were making their way to Jerusalem following the Six Day War. Soon after, Rabbi Brovender established Yeshivat HaMivtar for men, teaching Torah to beginners in an open, intellectual environment. At the same time, with the founding of Michlelet Bruria (today, Midreshet Lindenbaum), he revolutionized women’s Torah study by introducing in-depth textual study and Talmud to women’s learning, paving the way for other women’s yeshiva-style institutions. From the Yom Kippur War through the late 1980s, Rabbi Brovender also served in the IDF Rabbinate. 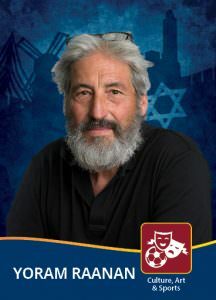 In 1999 Rabbi Brovender founded ATID, the Academy for Torah Initiatives and Directions in Jewish Education as an independent institution to train the future leadership of Jewish education, and to invigorate the field through the production and dissemination of new visions and strategies to deal with the crucial issues facing the field. In 2007, Rabbi Brovender launched WebYeshiva.org, the first online interactive internet Yeshiva. The purpose of the project was to draw on the large resource of quality teachers, and high levels of study and knowledge to be found in Jerusalem. WebYeshiva is able to offer classes around the clock with these teachers and bring them to the entire world via the web. 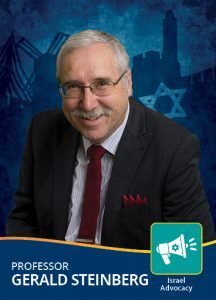 ISRAEL ADVOCACY: PROFESSOR GERALD STEINBERG is president of NGO Monitor and professor of Political Studies at Bar Ilan University, where he founded the Program on Conflict Management and Negotiation. His research interests include international relations, Middle East diplomacy and security, the politics of human rights and non-governmental organizations (NGOs), Israeli politics and arms control.Prof. Steinberg founded NGO Monitor following the 2001 UN World Conference Against Racism in Durban South Africa, where powerful NGOs, claiming to promote human rights, hijacked the principles of morality and international law. NGO Monitor provides information and analysis, promotes accountability, and supports discussion on the reports and activities of NGOs claiming to advance human rights and humanitarian agendas. In 2013, NGO Monitor was awarded the Menachem Begin Prize. He has published numerous academic articles, as well as books and review essays, and received a prestigious Israel Science Foundation research grant. In addition, his op-ed columns have been published in Wall St. Journal, Financial Times, Jerusalem Post, and elsewhere. CULTURE, ART & SPORTS: YORAM RAANAN is one of Israel’s most successful contemporary Jewish artists today. Inspired by the land of Israel’s beauty, heritage and people, Raanan’s art has brought him international acclaim. He currently has paintings on exhibit at the Waldorf Astoria Hotel in Jerusalem, the Wolfson Museum of Jewish Art in Jerusalem, and in museums, galleries and private collections around the world. Raanan’s paintings are an expression of Jewish collective consciousness, and contain a strong sense of light, depth color and spirituality. His work often reflects the Bible, nature, and the Land of Israel. LIFETIME ACHIEVEMENT AWARD: PROFESSOR ALICE SHALVI – Educator, feminist activist, social advocate and professor emerita of English literature, was born in Essen, Germany, in 1926. In 1934, together with her family, she emigrated to England, where she received her education, graduating from the University of Cambridge in 1947 and from the London School of Economics in 1949. In November 1949 she emigrated to Israel, where she taught in the Department of English at the Hebrew University of Jerusalem from January 1950 until October 1990, during which period she also held various administrative positions at the university, and received her Ph.D. in 1962. From 1975-1990 she served as principal of Pelech, a unique progressive high school for religious girls. 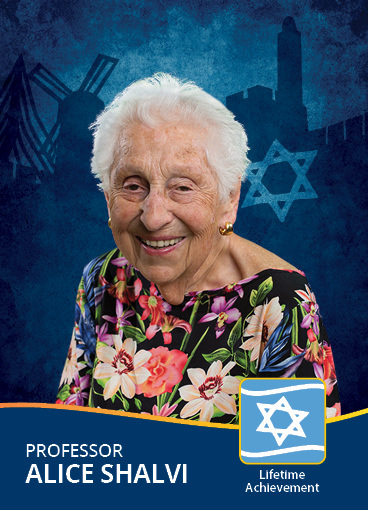 From 1984 to 2000 she was the founding chairwoman of the Israel Women’s Network, an organization dedicated to advancing the status of women in Israel, which became Israel’s major advocacy group on women’s issues. She has been an active and leading figure in a variety of social movements, peace and inter-religious dialogues and feminist activities, in both establishment and non-governmental frameworks. 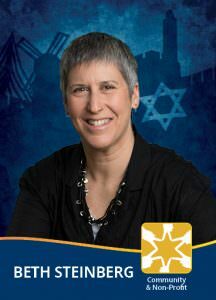 She is the recipient of numerous awards, including honorary degrees from a number of institutions of higher education such as Brown University, the Weizman Institute of Science, Hebrew Union College Jewish Institute of Religion, the Jewish Theological Seminary of America, and Ben Gurion University of the Negev. In 2007 she was awarded the Israel Prize for Lifetime Achievements in the areas of education, social welfare and human rights. 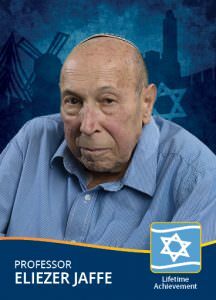 LIFETIME ACHIEVEMENT AWARD: PROFESSOR ELIEZER JAFFE, z”l – Professor Eliezer Jaffe, z”l, Emeritus Professor of Social Work and Philanthropy. He first came to Israel from the USA in 1957 as a volunteer and returned to obtain his doctorate in social work. Prof. Jaffe was one of the founders of Hebrew University’s School of Social Work and blazed the path for the social improvement and development of Israel’s non-profit sector. In 1990, Professor Jaffe founded the Israel Free Loan Association, where served as president until his recent passing. The organization has provided over 57,000 interest-free loans to low- and middle-income Israelis to date. He consulted numerous ministers, the mayor of Jerusalem, and many non-governmental offices to create social programs for underprivileged citizens, and taught in various universities. He was instrumental in establishing Israeli law regarding inter-country adoption and published several books. Professor Jaffe received the highest accolades, among them the President of Israel’s Citation for Outstanding Volunteer, the Sderot Conference Award for contribution to Israeli society, the Jerusalem Mayor’s Award for Outstanding Nonprofit Association Leadership, and the Bernard Revel Memorial Award, presented to the most outstanding scholar and community leader among Yeshiva University alumni. In 2011, he received the Speaker of the Knesset Prize for improving the quality of life in Israel, and in 2012, he received the Yakir Yerushalayim Distinguished Citizen of Jerusalem award. Prof. Jaffe made Aliyah from Cleveland, Ohio in 1960. SCOTT NEISS created the Israel Lacrosse Association in 2010, before officially making Aliyah in 2012. His efforts have resulted in hundreds of people visiting Israel, some even making Aliyah. 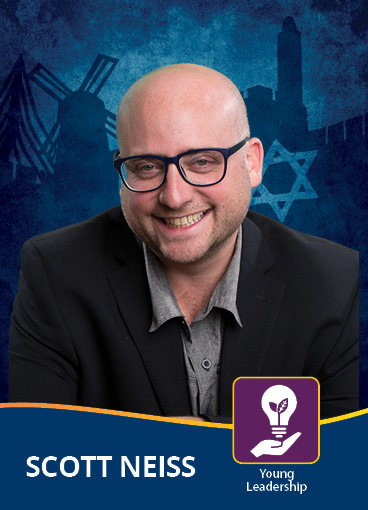 Scott structured the ILA to create opportunities for Diaspora Jews to come to Israel, and to get hands-on in developing the sport at a grassroots level. In the short time the ILA has existed, Scott’s efforts have resulted in hundreds of Jewish lacrosse players, coaches, and referees coming to Israel. The Israel Premier Lacrosse League is now in its third year, with eight teams — including in the periphery development towns of Kiryat Gat and Sderot — featuring players from across Israel and throughout the world. The kids there are extremely enthusiastic and the players have such a variety of backgrounds, despite lacrosse’s reputation for being an elitist sport. Neiss has also spearheaded the Israel national team program, which most recently earned a 2nd place finish at the European Lacrosse Championships. Additionally, it was just recently announced that Israel won the bid to host the World Lacrosse Championships in Israel in July 2018. There will be 50 countries and 2,000 athletes attending the Championship in Israel. 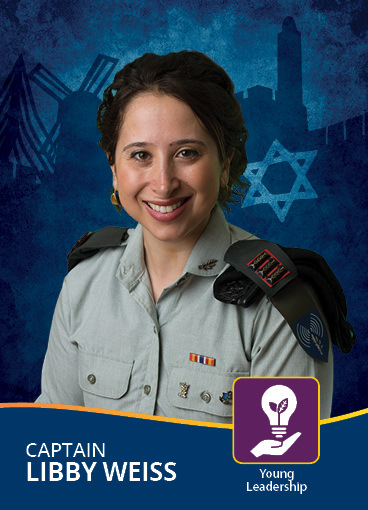 CAPTAIN LIBBY WEISS drafted into the IDF Spokesperson’s Unit in 2011 and currently serves as the Head of the Social Media Department. She previously held the position of the Head of the North American Media Department and has interviewed hundreds of times for leading news agencies, most notably during Operation Protective Edge on behalf of the IDF. Weiss also travelled to the Philippines and Nepal with the IDF following the natural disasters there and spearheaded the media coverage of Israel’s humanitarian missions there.Weiss is the recipient of the Presidential Award for IDF Excellence in 2014, as well as the prestigious Heseg Scholarship for Lone Soldiers. Weiss is currently completing her MBA at the Kellogg School of Management at Tel Aviv University and sits on the executive board of the Israel Government Fellowship program.